Also includes the villages of Bartlett, Carpentersville, Dundee and South Elgin, Illinois. Published by Evans Directory Service, 1933. Cover has some wear. Inside pages are nice and clean. Spine has a small area of tape residue that laps over onto the covers. 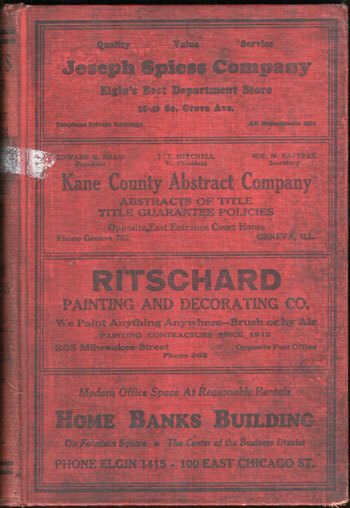 A directory of the residents of Elgin, Illinois in Kane County, Illinois. Includes name, address, name of spouse and occupation. Also includes a street directory of residents. The same information is also included for residents of Bartlett, Carpentersville, Dundee and South Elgin, Illinois. Hardbound, 542 pages. Also includes numerous business ads.